The internet was envisaged as a decentralised global network, but in the past 25 years it has come to be controlled by a few, very powerful, centralised companies. Blockchain is a technological paradigm shift that allows secure, reliable, and direct information transfer between individuals, organisations, and things, so that we can manage, verify, and control the use of our own data. Blockchain also offers a new opportunity for humanity to fix some major problems. It can authenticate data, manage its analysis, and automate its use. With better data comes better decision-making. In this way, Blockchain can contribute to solving climate change, reduce voting fraud, fix our identity systems, improve fair trade, and give the poor an opportunity to improve their lives by monetising their (digital) capital. A world built upon peer-to-peer transactions and smart contracts can empower individuals and communities. This book offers a fresh perspective with which to consider this transformative technology. It describes how Blockchaincan optimise the processes that run our society. It provides practical solutions to global problems and offers a roadmap to incorporate Blockchain in your business. It offers a blueprint for a better world. Filled with easy-to-understand examples, this book shows how Blockchain can take over where the internet has fallen short. "The authors tackle a timely and important new technology in an accessible and engaging way. This is a book that will reward you for the time you spend reading it, and we are already looking forward to reading it a second time. It is a worthy addition to the emerging collection of informative and helpful books on the world of blockchain." "The digital revolution’s first era failed to solve pressing social, economic and environmental challenges. Blockchain offers a once-in-a-generation opportunity to get it right. Blockchain: Transforming Your Business and Our World skillfully champions the opportunities offered by a new Internet of value." "So much more than JABB (Just Another Blockchain Book). Van Rijmenam & Ryan take you on a tour of the world’s potential with the blockchain trust protocol and its ability to change our world. When you’re done reading this book, you’ll be sketching the art of the possible … not dreaming about it. Trust is a competitive advantage. You earn it in droplets and lose it in buckets. 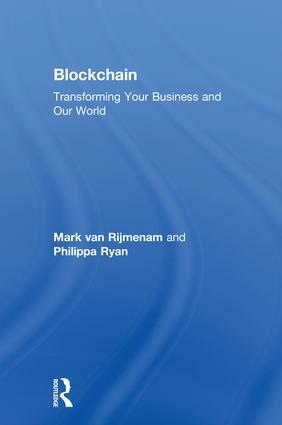 Van Rijmenam & Ryan turn the typical boring blockchain book upside and create a journey on how trust can change our world. More so, the book makes you dream big - not just about the changes that are coming - but ones that you can participate in or imagine on your own. Never really had a "Must Read 2018 Books" list … until now." Blockchain will do for trust what the Internet did for search. In a world of good and bad actors, where trust becomes a differentiator, Van Rijmenam & Ryan expand the blockchain aperture from the ubiquitous (and overwritten) cryptocurrency discussion, to a discussion of how trust can change the world: business, social, equality, and more." "This is a fine and important read especially the Blockchain history I thoroughly recommend you read, ponder and absorb for your token strategy planning"
"Blockchain’s potential is so much more than digital currency. Blockchain: Transforming Your Business and Our World is a step towards bringing that potential to life, exploring positive use cases and practical solutions to a diverse range of global social issues, from climate change and healthcare access to digital identity and poverty. For anyone interested in how we can build a better world with blockchain technology, this book provides an educational snapshot into what a more decentralized future could look like." Vinny Lingham, CEO and Co-Founder of Civic Technologies, Inc.
2. What is the Blockchain? Mark van Rijmenam is Founder and CEO of Datafloq and Imagjn, author and speaker, the Netherlands. Philippa Ryan is a Barrister and Lecturer in the Faculty of Law at the University of Technology Sydney, Australia.